JMM Track and Field: Spring Is Here or Is It? The outdoor season began this week as many outdoor seasons in Wisconsin do....COLD. The Wisconsin track & field season is an up and down season that takes the high school athlete through warms & colds, sun & rain, wind & snow, and some days all of these weather events at once. 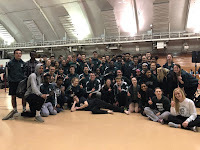 The Madison Memorial track & field athletes who were in town over break took to the outdoor tracks to compete in a dual meet against Madison East and some JV athletes partook in the Big 8 JV Conference Invitational hosted by Verona. These meets were a nice opportunity to "kick the tires" and get the outdoor season started for 2014. As we continue into the coming weeks athletes will be finding their events that they excel at and hoping to improve on a regular basis throughout the outdoor competitions. AND if we are lucky we will get some nice weather to go with improving athletes to make for a great outdoor season. Tuesday's dual meets vs East saw both the boys and girls teams victorious. The squads were led by the following athletes who finished first in their respective events earning them valuable team points in the competitions. BOYS 1st Places - Jake A in the 100m dash (11.5) & 200m dash (23.4), Micah P in the 110m hurdles (16.1) & triple jump (40' 7"), Daurice F in the 300m hurdles (42.9) & long jump (20' 8"), Zach H in the 800m run (2:16.0), Jake R in the 1600m run (4:57.0), Bryce H in the 3200m run (10:37.0), the 4x200, 4x400, & 4x800m relays, Price R in shot put (35' 4") & discus (101' 2"), and Trevis M in high jump (5' 2"). GIRLS 1st Places - Margot W in the 100m dash (12.9) & long jump (14' 2") & triple jump, Mariah OF in the 300m hurdles (52.2), Carly H in the 800m run (2:46.0), Siena C in the 1600m run (5:45.0), the 4x200m, 4x400m, & 4x800m relays, and Christina M in the shot put (30' 7.5") & discus (99' 11"). Some highlights from Thurdays JV Invitational include Hunter P going 6' 0" in the high jump & 8'6" in the pole vault, Ean M running 11.8 in the 100m dash, Ty B and Caleb S going 2:26 in the 800m run, Ben T running 5:15.5 in the 1600m run, James H going :48.0 in the 300m hurdles, Cole W throwing 37' 1" in the shot put, Eli H throwing 105' 7" in the discus, Van T jumping 18' 9" in the long jump & 33' 9.5" in the triple jump, Holly H throwing 32' 3" in the shot put and 69' 7" in the discus, and Joan M going 30.0 in the 200m dash. As these athletes continue to improve they will be competing for varsity spots and making our team as a whole better.